Choosing one of our Distinctive Design beach packages in Florida is the best decision you can make. Below are all of the details on our Beach Bliss Distinctive Design Package. A garter as a special gift for the bride and groom. Our beach packages in Florida are designed to give you modern and timeless designs. With many options from beach themed decor to floral designs, you are sure to find the wedding package that fits your style. 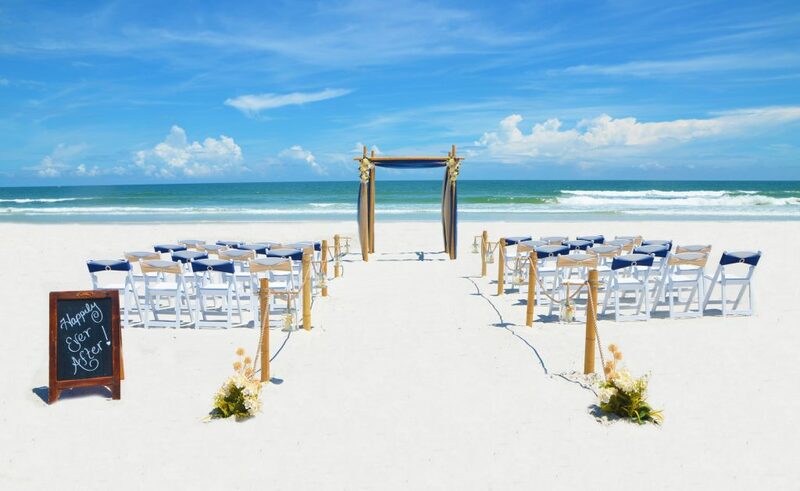 Our Beach Bliss Package allows you to choose from our wide array of canopy material colors and optional coordinating chair sash colors. The starfish decorated lanterns and floral arrangements on the beach wedding canopy and aisle-way give you the beachy feel without going overboard. We have been performing beautiful beach packages in Florida since 2007. Check out availability on our beach packages in Florida by contacting us today. We look forward to working with you!